Think of this scenario: You have that ~one~ childhood friend you've never seen as relationship material. But what if they end up dating your best friend, how would you feel about it then? If this sounds interesting (or at all familiar) then mark your calendars for April 18: My First First Love is a romantic coming-of-age drama that deserves to be #1 on your must-watch list. Cosmopolitan Philippines was lucky enough to interview the cast and director, including a private chat with My First First Love leading men Ji Soo and Jung Jin Young, in Seoul, South Korea. PSA: The boys were very good at maintaining eye contact. They made a seven-minute interview feel like 70! For #TeamJiSoo stans, you're in luck! The handsome Strong Woman Do Bong Soon actor takes the lead role as college student Tae-o, who reluctantly opens up his home to friends in need. "He's endearing," Ji Soo shares about his character. "I've been playing bold, masculine roles up to now, but this time I am trying [a role] that's closer to my age and a bit more lively and cheerful." Young actress and girl group DIA member Jung Chae Yeon plays Tae-o's close friend of 20 years, Song-i. After being evicted from her home and being abandoned by her own mother, Song-i moves in with Tae-o until she can get back on her feet. "Even through tough times, she's been strong and resilient," Chae Yeon says of Tae-o. Love In The Moonlight star and B1A4 member Jung Jin Young rounds out the main trio as Do-hyeon, Tae-o's best friend and Song-i's eventual love interest. Get ready to fall in love with this guy! "He knows how to express how he feels even though he may not be the most smooth [talker]," promises Jin Young. Choi Ri portrays naive heiress Garin, who runs away from home to escape her overprotective mother. She turns up at the home of her childhood friend Tae-o, hoping for a chance to experience "the real world" for the first time. In real life, Choi Ri's personality is just as bubbly as her character's. "I'm a very positive person and generally spread that positive energy anywhere I go." Tae-o's high school best friend Hun, played by Kang Tae Oh, is an aspiring musical actor. He is kicked out of the house after his parents discover he quit studying to pursue his dreams. He then visits Tae-o, hoping for a place to stay. 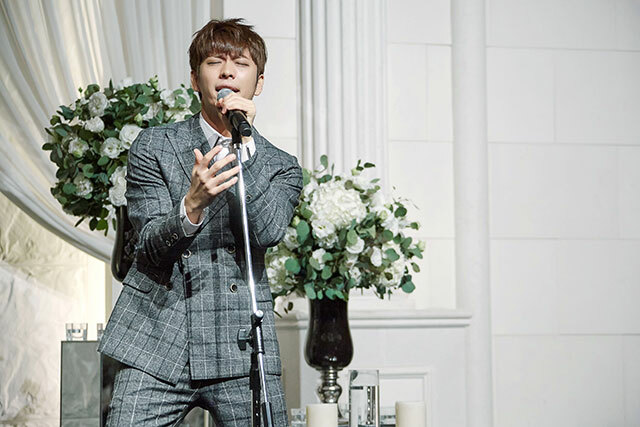 Dubbed the "Prince of Vietnam" for his performance in the Korea-Vietnam joint project, Forever Young, Tae Oh sees Hun as "energetic, good-humored, and the most positive guy among his friends." Still can't wrap your head around the plot? You can always watch the trailer below! Speaking of first loves, it was hard ~not~ to fall in love with the cast. Coined "Mr. First Love" by his classmates in the series, Ji Soo believes Tae-o is "a very endearing and lovely character." Jin Young's Do-hyeon, on the other hand, is known as "Mr. Last Love." According to Ji Soo, the characters earned those nicknames because "Tae-o is somebody you can date, but Do-hyeun would be the kind of person you would want to marry." And what about the last member of the love triangle? Ji Soo says Chae Yeon "brought vitamin-like positive energy to the set." Jin Young agreed, sharing "we had a lot of fun together. We had to do some retakes because we just couldn't stop laughing." My First First Love is available on Netflix starting April 18, 2019. What made you choose to join My First First Love, and what is the most attractive trait of your character? Ji Soo: Until now, my roles involved images that were tough and masculine, but in this series, I have a bright tone and I play a lovely character. Tae-o is very warm and carefree, and I believe that I am most similar to my true self when I am with these friends. Jung Chae Yeon: I was mostly attracted by how this series focuses on fresh youths. I really liked how they all live in a sharehouse. Song-i is going through a rough patch in life but she tries to keep her chin up all the time. I loved her easy-going and positive personality! 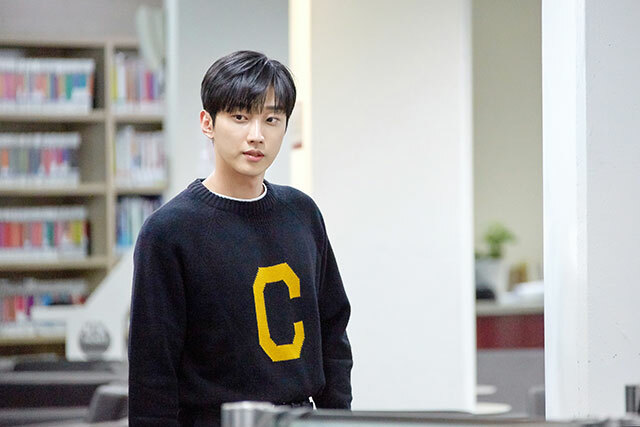 Jin Young: I was attracted to this series because while it is a romantic series, it does not necessarily package in a pretty way the fresh, first love [experienced by] those in their 20s, but it is rather realistically and vividly depicted. Do-hyeon, whom I play, is very clumsy with first love, but he has an attractive characteristic as he expresses his feelings truthfully to the girl he likes. Choi Ri: I really wanted to be involved in a youth series, and I decided to work on this series because I really felt the love from it. The biggest attractive points from Garin are her pureness and honesty. Kang Tae Oh: I fell in love with the scenario that contained various types of fresh youths in their 20s, and that's why I wanted to be in this series. Hun might seem like a troublemaker on the outside, but he is full of conviction and passion. Hun has vital energy and his charming personality is something that cannot be missed in the series. What was the hardest scene to shoot? And what scene was the most memorable? Ji Soo: The most memorable scene was at the condo during autumn with [my fellow] actors. The natural surroundings were beautiful and we had a barbecue party. It made me feel that we actually went there for fun. Jung Chae Yeon: Mapo Bridge. It happened to be a very cold day and it was very windy, so it was a particularly hard day. I was in that scene by myself so it felt even colder! Jin Young: There was a scene where I get very mad at Song-i (Chae Yeon) at the park, and it was a very cold day. I remember that I was not able to pronounce my lines very well because my mouth was all frozen. Choi Ri: I remember the hardest scene was filming on the overpass. It was a bit difficult because it was very windy and it was so cold that it made my lips frozen. The most memorable scenes were eating scenes. I often hear that I am a "good eater" and that I make everything I eat look delicious. I think I nailed eating scenes, and I was so happy. 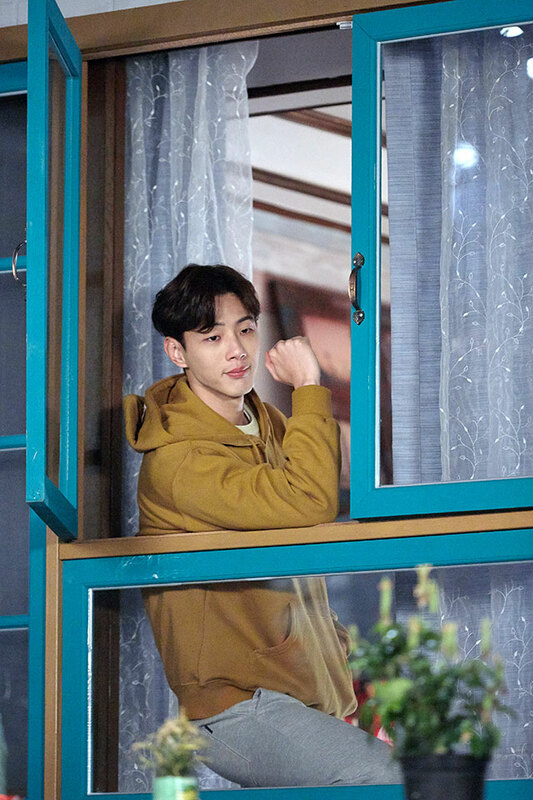 Kang Tae Oh: [My character] Hun first appears on the series when he gets kicked out of his house, losing everything, including the clothes he was wearing. I remember it was freezing cold because I only had my underwear on during the shoot. Chae Yeon, what can you share about working with your two male leads in My First First Love? On Ji Soo: I often thought, Shouldn't I be really close to Ji Soo to portray this kind of relationship? But thankfully, Ji Soo was very friendly, so we could get along well on set pretty easily. On Jin Young: He is so much like his character Do-hyeon—he was being romantic too, in reality! He's very sweet. Choi Ri, what role would you like to play next? I want to play the role of a village girl. I have been taking on modern and chic roles, but I actually come from a rural side of Korea, so I want to play the role of this naive, innocent village girl sometime [in the future]. Kang Tae Oh, what was the funniest memory you can recall during the filming of My First First Love? The actor was game enough to share two! When asked if he felt embarrassed to be running around in underwear and women's heels during one of his opening scenes, Tae Oh said, "Actually I picked the underwear myself! I wanted it to have a strong impact, so I didn't want to go for something plain. I wanted something that would go in line with my character. I was actually deciding between this $50,000 one-note print, or this gambling card print, but eventually, I chose the former." Another interesting anecdote on set: Whenever someone would call out for Ji Soo's character (Tae-o), the actor would automatically respond as well! "In fact, whenever someone would call out 'Tae-o', Ji Soo [and I] would turn around and say 'Yes?' That happened so often on set. It would have been nice if the director actually said our names right, but in fact, even the director made the same mistake. The name confusion continued until the very end of filming, but I actually liked it because I felt like I got a lot of attention." Director Oh, what was it like casting the actors of My First First Love? On Ji Soo playing Tae-o: He has been known [to play] dark and masculine characters. He has this eye line that is slightly long, and it goes well with his dark persona, but in fact, he also has this adorableness, like a puppy, and I always felt like he is a very charming character when he smiles. On Chae Yeon playing Song-i: My image of first love is a more modest image, rather than going for a person out of your league. Even if Chae Yeon is fancy onstage... she has this accessible, adorable, and endearing energy in her. On Choi Ri playing Garin and Tae Oh playing Hun: I actually picked [Choi Ri and Tae Oh] by looking at the chemistry between the two. I thought that they would fit perfectly for the roles. College is a time of personal growth. What advice would you give to students going to enter college and to seniors soon to graduate? Ji Soo: What I want to tell the youth is, Don't struggle too much with your goals. You have to seize the moment and enjoy the process. That will take you to your goals, eventually. Jin Young: I would say the same thing. Don't struggle too much, don't care too much about these instances, because youth will never come back to you. Just enjoy your time. Choi Ri: Based on my experience, I want to tell them, Don't be afraid to jump into more romances, [and experience] more love. Kang Tae Oh: For those of you who are entering college, you all have dreams and hopes for college life. I want you to achieve all those dreams and hopes, and as Choi Ri said, don't focus too much on studying—jump into love, [experience] getting hurt, and that will give you good memories. After you graduate and enter society, don't be afraid—it's your first time experiencing things, so it's natural that you'd make mistakes. As you can see in the series, that will help you grow in the end. I want you to lead a life where you continue to grow. Congratulations on your graduation! How would you describe My First First Love? Ji Soo: Fluttery. If you follow along with the emotion of the characters, you will watch it with [a] fluttery heart. Jung Chae Yeon: A series where everyone can feel and remember the fresh fluttering moments, and the series makes your heart warm. Choi Ri: I really love you. Kang Tae Oh: I believe it is growing up. There is [a] hardship that all the characters go through in the series. Each of the characters goes into [a] dilemma and they even get hurt. These things get together and it builds you up as a grown up.